This standard for organic textiles covers the production, processing, manufacturing, packaging, labelling, exportation, importation and distribution of all natural fibres. The final products may include, but are not limited to fibre products, yarns, fabrics and clothes.The standards focus on compulsory criteria only. 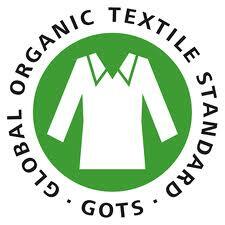 lling, trading and distribution of all textiles made from at least 70% certified organic natural fibres. The final products may include, but are not limited to fibre products, yarns, fabrics, clothes and home textiles. The standard does not set criteria for leather products. The GOTS certification also defines environmental criteria; technical quality and human toxicity criteria and social criteria. For a detailed list of all the criteria which are audited by the Control Union please click here.